I replaced a set of Dunlop OEM tires with a set of these, on a 2016 Mazda6, and have been quite satisfied with them, after having driven on them for about 3 weeks. Subjectively, I would say that the Continentals produce less road noise and have a slightly better ride than the Dunlops. Grip is excellent, especially braking on dry road. Great dry and wet, super traction in both, quiet as well. Have had only 1 experience in wet snow and very well, not perfect but did well. Very poor quality control at Conti. Upon delivery tires were all damaged on sidewalls, took 9 tires to get a quality set of 4. Reached out to Continental and they blew me off. First and last set of Continentals for me. I am on my second set of these upgraded and improved rubbers. I drive a sports car all year round in and around NYC and in all kinds of weather including snow. My car is rear wheel drive and I drive "spiritedly." These tires are some of the best I have ever driven on. Wear well, handle and corner like racing tires, great for the rain and in a few inches of snow will get you home if you drive right. These also look great. These are the highest rated all season high performance tires you can buy. 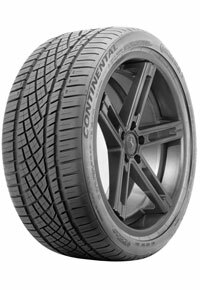 I Love these tires and recommend them to anyone looking for performance, good looks, and safety. DWS marks lets you know when they wear down and stop working in certain conditions (Dry, Wet, Snow). Pretty quiet and no body roll at all, stop on a dime. Purchased a complete set of these and I am very impressed with them. The main feature on these are the outer tire tread is rounded for cornering. By them doing this it gives the tire better contact with the road because when cornering the tires don't cup on the tread because the rounded edge prevents the edge of the tires from gripping causing the tread to squeeze together making it cup in the middle leaving only the outer edges of the tire to grip the road. These keep full tread on the road and my Challenger handles beautiful. These are just great overall tires and have super contact with the road in all weather conditions. I have used several performance tires and these are the ones that held up to what they were made to do. I am totally impressed with this tire. It handles like a sports car on a full sized SUV. I will definitely buy again. I recommend you register the tire for installation and rotate routinely to qualify for the mileage guarantee, which is hard to get for an SUV!